The histories of Miami and Biscayne Bay are intimately related. In addition to food, industry, transportation and recreation, the Bay provides a constant source of aesthetic satisfaction to those who live and work along its shores. Biscayne Bay is a tropical lagoon, approximately 35 miles long and a maximum of 8 miles wide. It is geographically divided into three parts: North, Central and South Bay. The North Bay is the most urbanized, bordered on the east by barrier islands, including Miami Beach, and including the Miami business district. Central Bay, extending from Government Cut to the southern limits of Coral Gables, has been affected by bulkheading and canal discharges. South Bay, aside from the Cutler and Turkey Point power plants, has been less affected by human activity and includes the northwestern portion of the Biscayne National Park. Over 100 years ago, Hugh M. Smith of the U.S. Commission of Fish and Fisheries was dispatched to Biscayne Bay to determine whether the region was suitable for a marine hatching and experiment station. He found that "the water of Biscayne Bay is exceedingly clear. In no part can one fail to clearly distinguish objects on the bottom when the surface is not especially rough." Since that time, however, a century of natural phenomena, development and urbanization have profoundly affected the health and character of the Bay. Dredging and filling, sewage disposal, channel and canal building, flood control practices, hurricanes, and intense development of the shoreline have profoundly altered the waters. 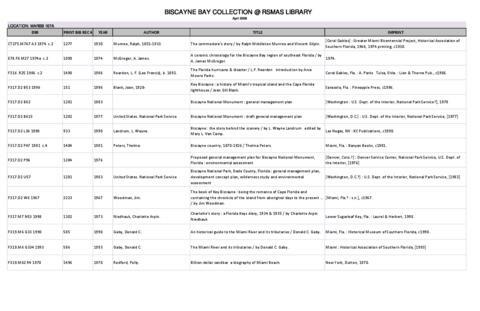 Information on the marine environment of Biscayne Bay is frequently requested by students, researchers, engineers, planners and the public. All the documents listed are available in the Library of the Rosenstiel School of Marine and Atmospheric Science (RSMAS) at the University of Miami. Included are books, scientific articles, theses and dissertations, book chapters, conference proceedings, reports, videos, and government publications. The bibliography does not include newspaper articles, accounts of public hearings, personal correspondence or articles from popular boating and sports magazines. Besides nautical charts issued by the U.S. Defense Mapping Agency, only a few maps are cited.